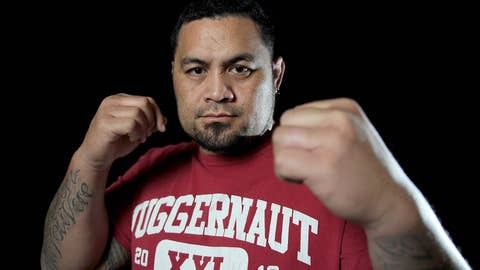 Beware the heavy hands of 'The Super Samoan'. It’s been a long time since Mark Hunt found himself here, in the position of headlining a major mixed martial arts event. The last time it happened was nearly seven years ago, when he gave Fedor Emelianenko a scare before succumbing to a kimura submission at PRIDE’s 2006 year-end show. "It’s been a while, yeah," Hunt told FOX Sports from the Grand Ballroom at the Brisbane Marriott Hotel. "Been a few ups and downs, but I’m happy to have the chance to do it again." For a while it seemed like he’d never get here again. The loss to Emelianenko was the second in a string of six straight. It got so bad that when the UFC bought PRIDE and acquired Hunt’s contract along with it, the promotion didn’t want him. Instead, they offered to buy him out of his deal. But money for nothing is not Hunt’s way, and he insisted upon earning the cash they were about to dole out. After a loss in his first UFC fight, he rebounded with a late career streak of four straight wins, including three knockouts. The surge resounded with fans who rallied to his underdog story, and even a third-round knockout loss to Junior dos Santos in his last fight hasn’t dampened enthusiasm for the Samoan slugger. At Saturday’s UFC Fight Night (which airs on primetime in Friday in the U.S.), Hunt attempts to begin anew. Facing current No. 4 heavyweight Antonio Silva, he has the chance to quickly reinsert himself into the discussion of the division’s best. It’s an opportunity he clearly didn’t see coming. "I just got chopped up in Vegas. I lost," he said. "I always fight hard. It’s one of those things. When you lose a fight, it’s one of those things where you don’t know what’s coming next." If he hits you in the head, you’re probably going to die. This time around, he won’t be facing someone with the standup prowess of dos Santos, but a giant that likes the clinch and groundwork. And if Hunt can emphasize his striking strength, he has the standup ability to upset someone a few rungs above him and reignite the Cinderella run that refuses to end. "Hopefully this moves me closer to the title," he said. "A win this weekend will move me closer, and I can continue to fight at a top level."